In Boston, where Nathalie works for the American Civil Liberties Union and attends graduate school, the Brazilian immigrant population is growing quickly. Nathalie points out that the city now hosts the largest population of Brazilians outside of Brazil. She also notes that while immigrants contribute much to the community, few social services are available in Portuguese. More troubling is the lack of trust between the immigrant community and law enforcement. Nathalie is familiar with this dynamic of mistrust, and she knows it is a prescription for violence. In her native Colombia, corruption exacerbated by the drug trade and ongoing war means that people do not feel protected by police. The relationship between law enforcement and the citizenry is adversarial, and officers of the law sometimes endanger lives instead of protecting them. Nathalie’s parents, also lawyers who are still practicing in Colombia, have received death threats when trying controversial cases that involve perpetrators from the government or military. Their procedure when threatened is to notify the office of the United Nations High Commissioner for Human Rights—and to keep a low profile. More than once, the family has had to move in order to stay safe. This is the reality in which Nathalie was raised. Even so, for her, the reward of fighting for social justice will always be worth the risk. In Colombia, she worked with survivors of domestic and sexual violence, as well as women internally displaced by the civil war. She also lobbied for women’s rights in public policy at the United Nations Population Fund. When she first arrived in the U.S., in an internship at Human Rights Watch, she investigated human rights violations affecting Central American immigrant women in Mexico. Nathalie will soon earn a dual master’s degree from Brandeis University in sustainable international development and coexistence and conflict. And for the past two years, she has worked for the ACLU on issues concerning the immigrant community. Despite the considerable Portuguese-speaking population in Boston, only one of her colleagues at the office speaks the language. 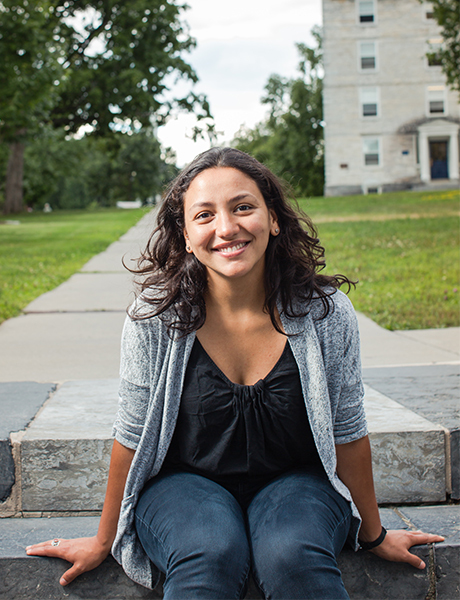 Proficiency gained over the course of one summer in the Middlebury Portuguese School is allowing Nathalie to serve the community on a whole new level. With Spanish as her native language, she was able to learn at an accelerated pace. She can now understand almost everything she reads and hears in Portuguese, and she speaks at an intermediate level. Every day her Middlebury experience augments her professional life. At the ACLU she works on getting legislation passed that will foster better relations with police among the immigrant community. When community members are not afraid to report crimes to the police, everyone benefits.